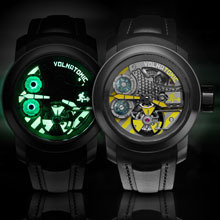 Volna is developing the Volnatomic Liquid Tourbillon under the guidance of Yvan Arpa. Housing a liquid element inside a noble movement that is a worthy representative of time-honoured expertise: such is the watchmaking challenge taken up by the Concepto Watch Factory based in La Chaux-de-Fonds. A technical feat successfully achieved in this exceptional, rebellious and daring piece that welcomes its traditional enemy and defies the laws of water resistance. The movement with its design inspired by the interior of ballistic missile nuclear submarines (SSBN), in tune with brand identity codes, features cut-out bridges with sandblasted, hand-bevelled finishing, a honeycomb structure and an atomic reactor symbolised by a tourbillon carriage shaped like an atomic propeller. Two “tanks” positioned at 8 and 10 o’clock are embedded into the movement mainplate and contain a blue coloured fluid that is also visible through a sapphire crystal on the side of the watch. During winding and time-setting operations, the crown activates the pictogram and the arrow as if to signal danger and the need to escape. The yellow colour applied to various movement parts contains superluminova pigments which are also present in the immersed central tube of each tank evoking uranium storage pools. When plunged into darkness, the movement treats us to a spectacular luminescent festival in which crime scene, emergency exit and radiation danger signs meet and mingle to create impressive visual effects. Whether by day or night, the Volnatomic Liquid Tourbillon will be admired on the wrist of only ten passionate enthusiasts. Cut-out bridges and mainplate with sandblasted hand-bevelled finishing, honeycomb structure and yellow motifs with superluminova. Glass : 2.5mm thick spherical sapphire crystal glareproofed on both sides. Strap : Genuine rubber with yellow hand stitching, black PVD-coated double pin buckle.